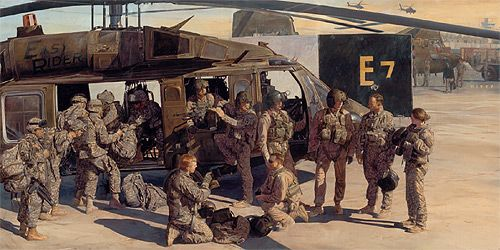 James Dietz Handsigned and Numbered Limited Edition Print:"Launch, Recover, Launch"
About the Artist: When MG James E. Simmons, Deputy Commanding General of Multi-National Corps Iraq, referred to Operation Iraqi Freedom as "the second helicopter war," he made reference both to the distinguished heritage of Army Aviation stretching back to the first helicopter war, Vietnam, and to the incredible contributions of Army Aviation to the counterinsurgency campaign in Iraq. Army Aviation has become more indispensable in each succeeding year of this conflict; Task Force XII and Task Force 49 have added unprecedented achievements to that record in OIF 07-09. The first 12th CAB unit in Iraq was the 2-159th "Gunslinger" Attack Reconnaissance Battalion from Illesheim, Germany. On 30 June 2008 they made first contact with the enemy near Ramadi. The "Professionals" of the 412th Aviation Support Battalion deployed next and accomplished air and ground maintenance and logistical support for the task force. The 3-158th Assault Helicopter Battalion from Katterbach, organized as Task Force Storm, arrived in July and began air assault support for Special Operations missions. The "Storm Riders" were joined in their mission by Company B, "Big Windy," 5-158th General Support Aviation Battalion. Task Force Ready, made up of the remainder of Katterbach's 5-158th GSAB, took on general support missions, moving Soldiers and cargo throughout the theater. They also took on the VIP mission in Iraq, allowing senior leaders to move quickly and safely throughout their operational areas. Joining the 12th CAB at Balad was the 2-147th "Dust Devil" Assault Helicopter Battalion. These National Guard Soldiers came from Minnesota,Washington and Hawaii, and joined Task Force Ready in general support missions around Iraq. Completing Task Force XII at Balad in November 2007 were the Soldiers and fixed-wing aircraft from Task Force Hawk, 244th Aviation Brigade. A combination of National Guard and Reserve Soldiers, they flew the Army's only non-reconnaissance fixed wing aircraft in Iraq. In November 2007, Task Force XII received a change of mission. The Brigade Headquarters and 3-158th AHB moved to Camp Taji, Iraq to form an aviation task force in support of Multi-National Division - Baghdad. Just before Thanksgiving, Soldiers from Fort Wainwright, Alaska's Task Force 49 arrived and assumed the mission as the headquarters for the five battalions at Balad. Task Force XII and 3-158th arrived at Camp Taji in December and joined the 4th "Longknife" Squadron, 3d Armored Cavalry Regiment, from Fort Hood, Texas. 4/3 ACR proved a perfect fit for the newly-formed task force. They provided aviation maintenance and AH-64 attack capabilities for the division, and also brought a troop of Black Hawk helicopters which joined with Task Force Storm to perform air assault and general support missions for MND-B. Task Force XII also formed a tactical unmanned aerial vehicle company at Taji. Comprised of Soldiers from throughout the brigade and UAV operators from six of MND-B's brigade combat teams, Company G, Task Force XII ran the largest UAV operation in Iraq. In addition to forming the task force for MND-B, Task Force XII deployed aviation packages to support Coalition forces in central and southern Iraq. Indeed, the Gunslingers and Dust Devils spent much of the 07-09 deployment split across two or three separate operating locations. During a spike in violence in late March, 2008, Gunslinger, Storm, Dust Devil, Big Windy and Longknife aviators distinguished themselves by responding heroically to aggressive enemy attacks in Basrah and Baghdad. The pilots flew hundreds of hours across Iraq and recorded dozens of successful engagements in a three week period of intense combat. Their actions were cited as helping to bring about a quick and decisive end to daily indirect fire and force on force attacks. With a final mission change in July 2008, TF XII returned to the MNC-I mission at Balad, while 4/3 ACR and TF Storm moved to Baghdad International Airport to assume the mission for MND-Center under TF 49. Over the course of their deployment to Iraq, the Soldiers of Task Force XII and Task Force 49 set the standard for aviation support in theater. OIF 07-09 was a key period of transition, as an increase in ground combat forces reduced violence to historic low levels, setting the conditions for political reconciliation. Units at Balad, Taji, BIAP, and Basrah combined to fly more than 110,000 hours, moving more than 272,500 passengers and almost 18 million pounds of cargo, and engaging the enemy on over two hundred separate occasions. Launch, Recover, Launch depicts a routine moment during the brigade's five hundred days of flying and fighting in Iraq. Along Alpha Taxiway at Balad, a UH-60 "mission set," two Blackhawks and their crews, prepares to launch. The crew members of Chalk One inspect their aircraft, their equipment, and each other to ensure that all is ready. A group of Soldiers load equipment while crew members conduct a final mission briefing. In the background, a CH-47 Chinook stands ready to launch after sunset on a critical resupply or air assault mission. Overhead, a Gunslinger Air Weapons Team leaves Balad on a mission in support of ground forces somewhere in Iraq. Ground support personnel move about the ramp, refueling aircraft and conducting maintenance services. This seemingly mundane but incredibly complex scene encapsulates the daily contributions of over four thousand Soldiers, of all ranks and occupational specialties, to the incredible achievements of Task Force XII and Task Force 49.